Hi, I'm Jai Soots, a Portland, Oregon based celebration and portrait photographer. I promise to photograph your celebration with an eye for sincere expression and a commitment to elegance, whether you've chosen an intimate gathering in your parents' backyard, a ballroom in Beverly Hills, or a mountain lake in the Canadian Rockies. Let's create photographs that make your heart full. It was some kind of magic that placed Thomas Lauderdale's piano in the gorgeous garden for the von Trapps "Dream a Little Dream" video. The tortoise's were bonus works of magic. Dalya's bat mitzvah at Jeld-Wen field was as much about the love she shared with her father for the Portland Timbers as the love she had for everything Big Apple. Her parents just beamed at her during the rehearsal at Neveh Shalom. Danny traveled the world in search of the perfect tiramisu! A noble and worthy pursuit. He put his family to the test-who makes the BEST tiramisu? One of his sisters? His mom? Danny's globe trotting theme was a world of fun to photograph. One of the first bar mitzvah's I photographed in early 2013, Jonah's celebration was a blast with a cardboard cutout of the Queen, every kids dream of a self serve candy bar, and break dancing with confetti. Annie's bat mitzvah party at Exchange ballroom was inspired by the sophisticated palette of a classic ballet. Before the guests arrived, Annie twirled around the ballroom, as BLC events worked magic on the details. Elegant monogramed napkins, white flowers and fairy lights, with lush greenery. One of the things I love most about being a photographer is the honor of creating art that becomes part of a family's heritage. That's why every Love & Photography service option comes with your choice of an album or a print credit. Whether you've chosen art prints to frame or a locally made, hand bound album to experience each moment of that day once more, you and your family will be proud of the quality of materials 50 years from now. Everyone loves a good party. The best graduation party ever? Rehearsal dinner? A Moroccan themed 50th birthday celebration? How many reasons does life give us to celebrate? Who will we share that with? 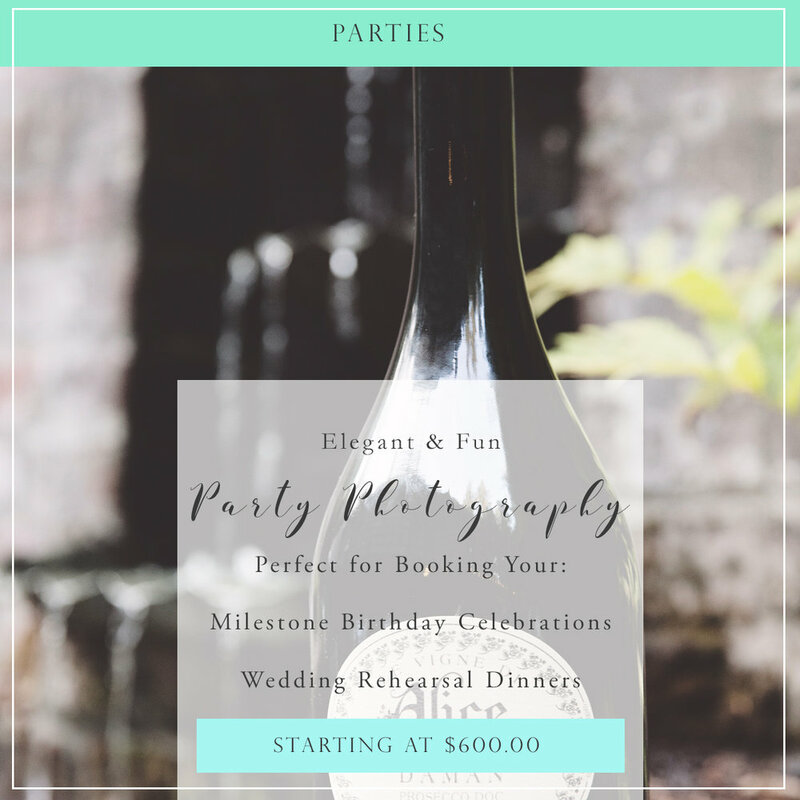 Party coverage includes all your images in a private gallery with custom printed invitations for your guests to download the photos they love. Photographing a coming of age celebration is an honor. From the anticipation of the rehearsal-the moments leading up to your daughter or son becoming an adult in the eyes of your community, to all the joy and dancing at the party; it's the reason I refer to this genre of photography service as "legacy." Bringing Love and Photography together - a perfect marriage! I specialize in vintage inspired weddings, and love to photograph couples "in the manner 0f" their chosen decade, using lighting and developing techniques that enhance the story of that bygone era. Vintage film camera coverage is available! Let's connect about creating photography that honors your love. When will you two exchange vows?